Most folks won’t even contemplate getting into the kitchen to create a nourishing pot of bone stock. Oh the horror! Their idea of spending 24 hours in the kitchen slaving away over a pot of stock, is just that; an idea. It’s not reality. 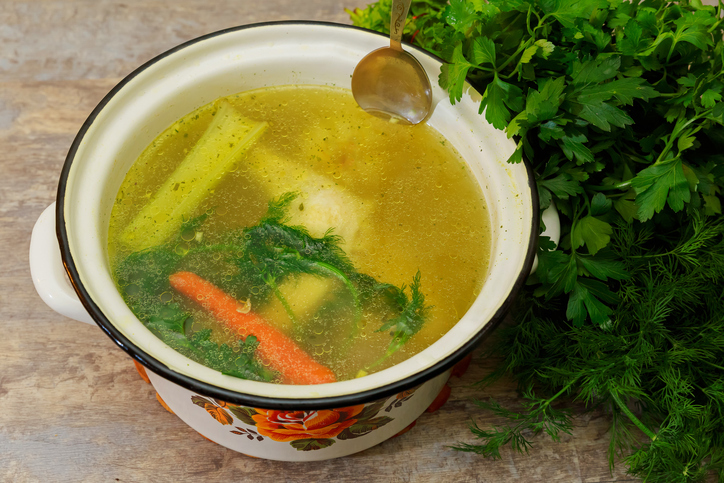 The reality is you can have this amazingly nourishing broth with a minimal amount of time, effort or energy spent in the kitchen. Get yourself a crockpot, throw all of your ingredients into it, set the timer, and go. OR you can use ½ bag of kitchen scraps that you have saved in the freezer in gallon sized bags. For example: if you peel and chop any vegetables - onion, scallions, leek, carrot, celery, parsley – put the scraps (onion skin and roots, ends of carrots, celery leaves and ends, parsley stems, etc. ), into a gallon-sized freezer safe bag. Add chicken and veggies into a 7 qt. crockpot. You can add water up to 1 inch from the top. Cover and cook on high heat for 8-10 hours. Turn heat to low and cook an additional 10-12 hours. Strain and discard bones and veggies.